Is Your Weight Training Program Improving Your Performance? It was last Sunday night at 7:30 PM and I was boarding a plane from Houston to Tampa when I received two consecutive text messages that really left me for perflummoxed (that’s a totally made up word meaning perplexed and flummoxed). I had spent the weekend with my friends from the Texas baseball ranch, assisting them with an incredible Elite Pitchers Boot Camp. Last I checked, the weight room was supposed to make you better, not hurt you or cause you to miss training time. These 3 muscle heads could have seriously hurt themselves. If you rupture a lumbar disc, you could be ending your baseball career. At best, each of these 3 guys will be down for about a week until we get them righted. That’s a week of training time they’ll never get back. Listen, I AM NOT ANTI-WEIGHT LIFTING! I am anti-STUPID weight lifting. Becoming an elite level baseball athlete is all about building POWER. POWER is what you find at the intersection of STRENGTH and SPEED. Building strength in the weight room is great, but you had better be able to move that strength. And although he looks better than me in a swimsuit, I think I could whip him in a fight! For many years now we have totally missed the boat on strength training in baseball and in many other sports. Strength training is good if it helps you get better at your sport. It doesn’t translate to performance gains on the field. The strength training industry has been corrupted by 2 different groups of well meaning practitioners.The bodybuilding industry focuses on isolating muscles and creating hypertrophy in individual body parts. They often neglect the mobility constraints they create, because bodybuilding is not about function or athletic performance. It’s about one thing – looking good. But as we all know, looking good doesn’t always translate to playing good. The other discipline that has corrupted strength training is my own physical therapy profession. I am embarrassed to say that many in my industry (either due to lack of knowledge or professional malaise) have failed when it comes to developing/restoring power that translates to performance. Part of the problem is insurance and attorney driven. Therapists shackled by auditor oversight and the threat of lawsuit practice defensive medicine. Often for the Physical Therapist, it’s about limiting stress and completely eliminating the risk of injury or regression. It’s not uncommon to see patients log 6-8 weeks of regular physical therapy and add no additional resistance to a movement or an exercise. If your strength training program doesn’t improve your coordination in your specific sports’ activities, it is of no value! You might come out of it looking like a Calvin Klein underwear model, but it won’t make you a better player. At The Florida Baseball Ranch we have studied strength training for baseball players for the past 8 years. We have conducted our own in-house research to identify the types of exercises that translate most directly to increased power on the mound and at the plate. 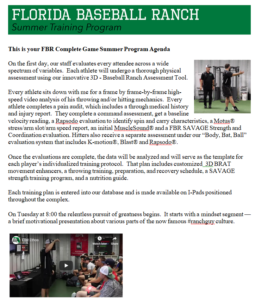 And one thing we’ve come to realize is that every athlete needs his very own customized program. Every athlete presents with a unique blend of physical attributes and constraints. One-Size-Fits-All programs are never optimally useful and can indeed be dangerous. Each athlete’s training plan must be built to address all of the unique mobility, strength, and motor control deficits present. That requires a thorough, holistic assessment, and frankly, many programs or people aren’t knowledgeable or equipped enough to execute such an evaluation. We maintain and operate a fully functional weight room. We view it as a valuable cog in every athlete’s development. But we insist on hyper-individualized programs designed by trained professionals. We are certified in the world-renowned and highly acclaimed Functional Movement System (FMS) and its medical counterpart, The Selective Functional Movement Assessment (SFMA). We apply those concepts with our own 4 Pillars of Explosive Player Development and we design individualized weight training program that translate to power on the mound for our pitchers and at the plate for our hitters. Our Strength and Conditioning Coordinator, Lisa Church was in the fitness and nutrition industry for 15 years. She competed and won the title of Tampa Bay’s Fittest Female in 2008. Then she decided there was more learn about health, wellness, fitness, and strength, so she went back to school and became a Licensed Physical Therapist Assistant. Sign up for one of our ARMory Strong Weight Lifting Sessions and Lisa, I, and our highly-trained staff will conduct a world class assessment and will design an individualized weight training program specifically for you. Then we’ll personally supervise every lift and exercise to make your technique and execution spot on to ensure the greatest gains and the highest degree of safety. We’ll assess and document your progression every step of the way and we’ll constantly adjust the process to guarantee transfer to your performance on the field. Our ARMory Strong weight training sessions are offered daily at 3, 4,5, and 6 pm. If you are currently an active student, you can use 3 credits and register on line just like you do when you sign up for a class. Here are the steps to sign up. If you aren’t a current student give us a call at 1-866-STRIKE3 (787-4533) and we’ll walk you through the process so you can get started. Cause its all about POWER!!! !